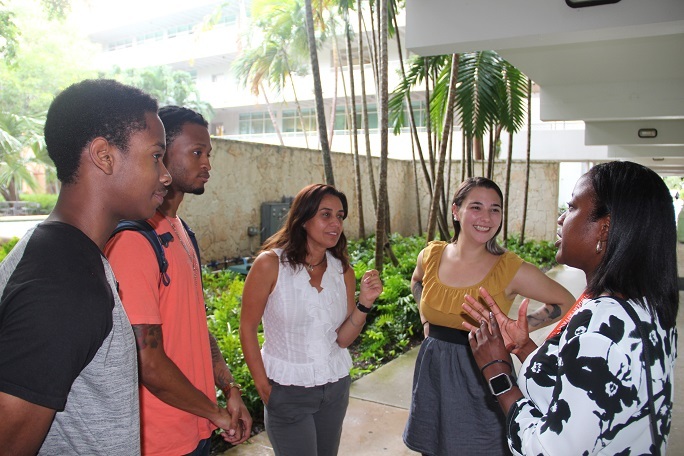 The Children and Youth Law Clinic is a key partner, along with UM’s School of Education and Human Development, in First Star University of Miami Academy -- a holistic college prep program for youth impacted by the child welfare system. Foster youth can get tuition waived at Florida state colleges, but lacking the skills, study habits and support, foster youth inevitably drop out. First Star’s goal is to change that and lay a foundation for success. Launched in the summer of 2017, the UM Academy accepts rising 9th graders to participate in four years of Academy programming with a focus on academics, life-skills and caregiver support. The goal of the University of Miami Academy is to keep youth on track for high school graduation and prepare them for higher education and adulthood. The Children and Youth Law Clinic and the School of Education and Human Development are involved in all aspects of program design and implementation, with involvement by faculty and students in both schools. The cornerstone of the First Star UM Academy is a four-week summer residential program on the University of Miami campus. Students live in residence halls and attend daily academic and life-skills classes. The summer program also includes field trips to local businesses, cultural destinations and social activities. Students receive instruction in math, language arts, science and other subjects throughout the year. All youth participating in the program are also assigned an education advocate who reviews their school records, tracks their progress towards high school graduation, and identifies and secures any supports needed to succeed in school. The education advocates work with the youths’ caregivers, social workers, attorneys, and schools to develop an academic plan for high school graduation and admissions to higher education. The Academy also develops and implements a life skills curriculum to ensure the youth are prepared for adulthood. Workshops focus on psycho-social and self-efficacy skills, and also include topics such as budgeting, nutrition, healthy relationships, and substance abuse. The University of Miami Academy works with attorneys and social workers to advocate for youth to be in appropriate homes, and then engage caregivers to ensure they have the supports needed to support youth academically. The goal of these efforts is to ensure that youth transition into adulthood with strong relationships with adults who can provide ongoing and continued support. At the University of Miami, the Academy is the result of a partership with First Star, a national organization dedicated to improving the lives of foster children through innovative college preparatory programs, and Our Kids of Miami-Dade/Monroe. First Star partners with universities and child welfare agencies throughout the country to make a long-term investment in foster youth and change the course of their lives, from abuse and neglect to academic achievement and self-sufficiency. The Academies are the country’s only long-term programs for high school foster youth that include both four immersive residential summers on a university campus, and monthly sessions during each school year. The First Star Academies currently serve approximately 350 youth across thirteen campuses like the University of Miami.